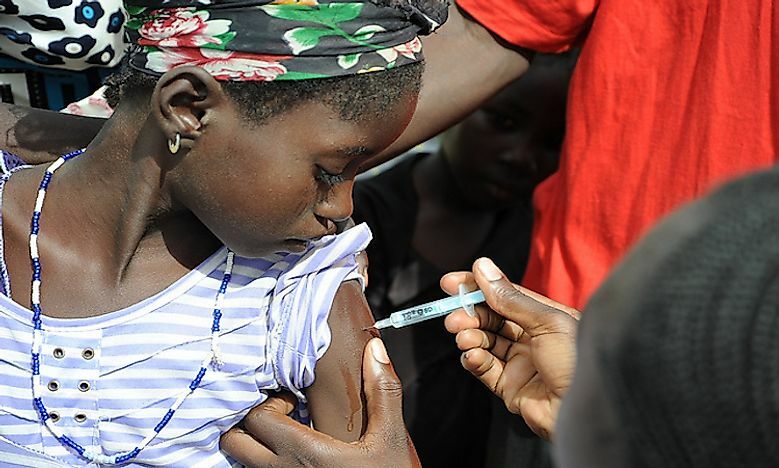 Similar to other countries in sub-Saharan Africa, infectious diseases, malaria, HIV/AIDS, and malnutrition plague the population of Burkina Faso. In Burkina Faso, high rates of poverty, lack of awareness and education leads to low life expectancy in the country. Burkina Faso is considered as the fourth poorest nation in the world today. The per capita income stands at a low $1,660 USD. Like other countries in sub-Saharan Africa, infectious diseases, malaria, HIV/AIDS, and malnutrition plagues the population of over 18,450,000 people. Its population’s average life expectancy at birth is about 57 years for women and 56 years for men. The country's 'under 5 years' mortality rate is about 69 per 1000 live births. In 2011, health expenditures in the country were 6.5% of its GDP which was a big improvement over government health spending of just 3% in 2001. Healthcare before 1993 in Burkina Faso was founded on the all-state framework that had many limitations due to centralization which delayed decisions and assistance to the country’s poor population. Lower Respiratory infections account for 14.3% of total deaths in the country. Another major killer is malaria responsible for about 10.3% of the total deaths in the country. The female Anopheles mosquito is the vector for the malarial pathogen, Plasmodium. Lack of proper hygiene, the absence of awareness and knowledge of the disease, and extreme poverty triggers frequent malarial epidemics in the country, killing thousands at a time. Safe and clean drinking water and proper sanitation facilities are lacking in the majority of households in Burkina Faso leading to high rates of diarrheal diseases responsible for about 6.2% of all deaths in the country. Stroke is a high-risk condition that kills many people in Burkina Faso each year. Poor nutrition, obesity, and smoking trigger stroke in individuals. Premature births caused by stress, lack of maternal care, and malnutrition causes preterm birth complications that kill many infants in the country. Stress, improper nutrition, lack of access to emergency medical kills many people suffering from ischaemic heart diseases. Birth asphyxia and birth trauma, HIV/AIDS, meningitis are the other leading causes of death in Burkina Faso. Healthcare in Burkina Faso suffers a setback due to financial losses from hospitals incurring debts due to patients’ inability to pay their bills. Access to healthcare is also low, especially among the rural population in the country. The urban population had access to one national hospital and three university hospitals while rural health is provided by 1,429 health facilities and 63 district hospitals located across the country. Despite these strides in its healthcare system, statistics show that for every 100,000 people, only 6 doctors, 41 nurses, and 13 midwives administered to their health concerns.